5S floor marking is an implementation system that optimizes productivity through an organized workplace utilizing visual markings. Today, we utilize 5S floor markings not only for organizational purposes, but also for good safety practices. Concare installs highly durable 5S floor markings to help keep your facility working safe and efficiently in top performance. 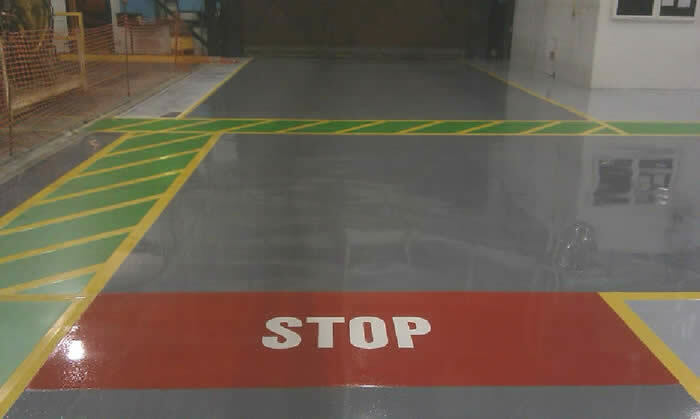 The 5S floor markings stand up to the harshest environments including forklifts, trucks, weather conditions and various chemicals. 5S floor markings can be put in after Concare installs your new concrete floor protection system giving your floor strength, durability and long lasting wear. Contact us to install your 5s marketing today.